A BFA Certified Organic fertiliser that supplies a complete spectrum of nutrients for vegetables, fruits, vines, flowers,turf and ornamentals. Campbells Organic Plus is approved by the Biological Farmers’ Association. Organic Plus can be used as a base fertiliser, or in conjunction with conventional fertiliser programs. of these products provides a higher analysis organic fertiliser, which more closely meets the nutritional requirements of a vast range of horticultural crops. Organic Plus uses the highest quality products to help maintain a productive and sustainable soil environment. 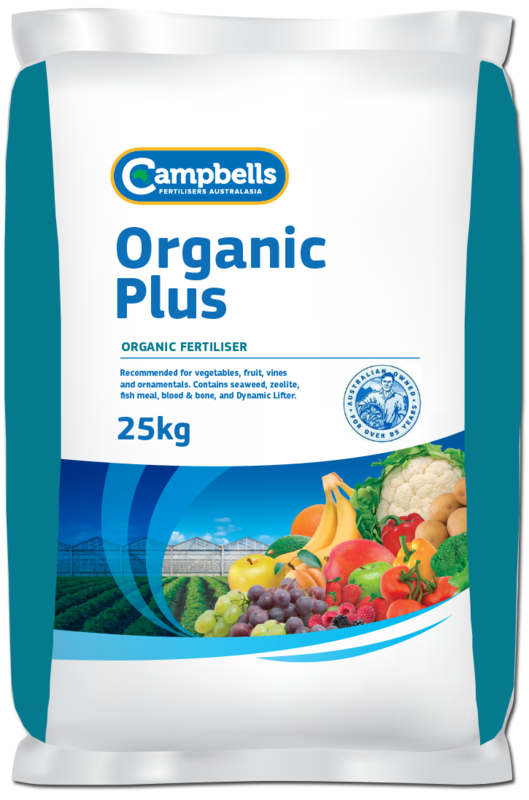 Campbells Organic Plus is ideal as a base or top dressing. broadcast or can be incorporated into the soil or growing medium prior to planting. General rates for horticultural crops are between 500-1000 kg/ha – however higher rates are sometimes recommended as base applications during soil preparations, where Organic Plus is incorporated into the soil prior to planting. The actual rates, number of applications and their timing will vary considerably for different crops and for different districts. Before application, seek advice from your Campbells Organic Plus distributor or your local agronomist.